The trials, travels and triumphs of owning, restoring and traveling with our vintage shasta. Hardly Strictly Bluegrass was Strictly Awesome! 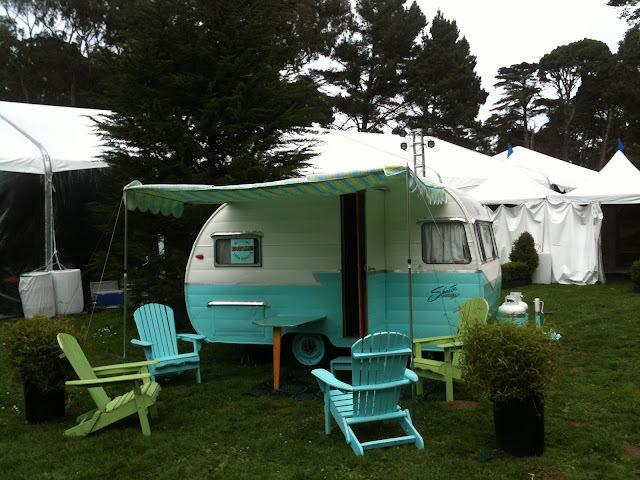 As was posted a while ago, my little trailer was asked to become part of the set backstage at Hardly Strictly Bluegrass, one of the country's largest (if not the largest) free multi day music festival. HSB as it's known, is a Bay Area treasure which along with the Treasure Island Music Festival and Bridge School Benefit makes October a very special month for music here abouts. Created 12 years ago by the late Warren Hellman, the Bluegrass loving Billionaire and antidote to wall street greed and inhumanity, to introduce his beloved San Francisco to Bluegrass music, Strictly Bluegrass evolved from a 2 day 3 stage affair to Hardly Strictly Bluegrass a 3 day, 6 stage, multi genre music extravaganza that well over 100,000 attend each year. To give you an idea..Here's the line up from this year. Days and Days and Days of Painting! So as you know I have to get my little trailer painted in time for Hardly Strictly Blue Grass the first weekend of October. I decided to roll on paint using the $50 dollar paint job method that is very popular for both cars and trailers. If I had it to do over again I would probably try to spray cause it took so long! 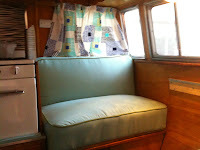 I consider myself fortunate to have retained the original dinette bench seats complete with springs. These are very comfortable both to sit on and sleep on but the original vinyl after 56 years was showing it's age. Time for a facelift. Estimates for a custom upholstery job...ran upwards of $700 for both seats--so DIY was definitely in order. Readers of this blog know I had been considering up-cycling vinyl saved from convention signs. I even went so far as to pick out sheets of vinyl. Several factors kept me from proceeding. Just got back from the 2012 Fall Strawberry Music Festival. Gorgeous weather and the exceptional line up more than made up for the much more crowded camping scene. Below is the "road" the first line of Strawberry that begins before dawn on the First Day of the Festival as 4-5 miles of vehicles await entry and then an orderly but urgent scramble to obtain their cherished campsite. 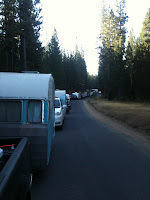 The line: We were about a mile back even though we pulled onto the road well before the stated 6 am line up time. That's us in the middle, and then a miles long line behind us. We ended up with a fairly nice campsite, nearby our usual spot. We did have a fairly cozy relationship with a rather large tree branch. The new door and screen door worked out brilliantly! Ben wasted no time hopping on his bike with all of his climbing gear to find a suitable spot to set up an anchor and rappel. He spent hours scrambling on the big granite outcropping along Sunrise Trail. Guess who's going to be at Hardly Strictly Bluegrass? Aguadream will be featured as part of the backstage set at Banjo Stage, the main stage, at this year's Hardly Strictly Bluegrass Festival (fondly known as either HSB or Hardly Strictly). HSB is perhaps the worlds largest free music festival, held each year the first weekend of October in Golden Gate Park. You can learn more about HSB and the legacy of it's founder and benefactor, the late Warren Hellman at http://www.strictlybluegrass.com/ Apparently this years theme is Travel America, including a huge "Mt Rushmore" featuring the faces of some of the legends who have passed this year including Hellman, Doc Watson, Hazel Dickens and Earl Scruggs. Of course, this will mean a flurry of activity to get her looking her absolute best. I've been reupholstering the dinette seats, and this weekend is Painting!! A few finishing touches after that and she'll be the belle of the ball. Really any color I want?!! I have been a little obsessed lately with paint. Now that the doors are "almost" done (still need to hang it) I am turning my attention to the most obvious undone aspect of my restoration....exterior paint. There are many options here...most of which have their own sub options.